The Telematics Detroit conference always provides a great opportunity to take the pulse of the automotive connectivity market and understand what key players in the industry are doing — and are planning to do in the next couple of years. Prior to the show, I had the opportunity to participate in an executive roundtable session hosted by Ernst and Young. The focus was the future of mobile integration and how it will change the market as we know it. The roundtable brought together views from the entire ecosystem, including OEMs, tier one suppliers, software and service providers, dealerships, and, ultimately, the end consumer. It was a great session with a lot of interaction. QNX technology concept car based on a Bentley Continental and outfitted with our latest instrument cluster and infotainment concepts. Check. 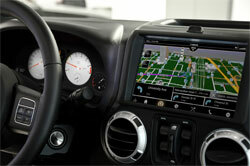 QNX reference vehicle based on a Jeep Wrangler, rocking a new Qt-based HMI on the QNX CAR Platform for Infotainment. Check. How about a functional over-the-air software update demo from our colleagues at Blackberry to blow people away? OK, got that, too. 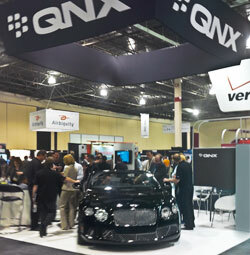 And let’s not forget a demo showcasing the latest in fast boot technology and Android app integration for the QNX CAR Platform. Check, and ready to go. In addition to great booth traffic, I had the opportunity to participate on a panel on autonomous vehicles and the challenges they present — the discussion was very engaging and it did in fact “drive” traffic to our booth for further discussion. Meanwhile, my colleague Andrew Poliak presented a keynote on HMI trends. To my mind, his talk clearly demonstrated that we are thought leaders in this industry. The evening brought the annual Telematics and Tonics mixer, co-hosted by QNX and several of its partners: AT&T, NVIDIA, Pandora, Tweddle, and Elektrobit. It was a huge success with well over 300 attendees — standing room only, all night. There were great discussions with great people until the wee hours of the night… really wee hours. Day 2 was busy, busy, busy. Did I mention it was busy? We provided demos galore to OEMs, tier ones, partners — the works. Andy Gryc sat on a panel discussing the ultimate intuitive user interface and knocked it out of the park, as he always does. The booth was busy until the show closed. We then we put the cars to bed in their shipping truck and headed off to the airport, tired but extremely happy nonetheless.